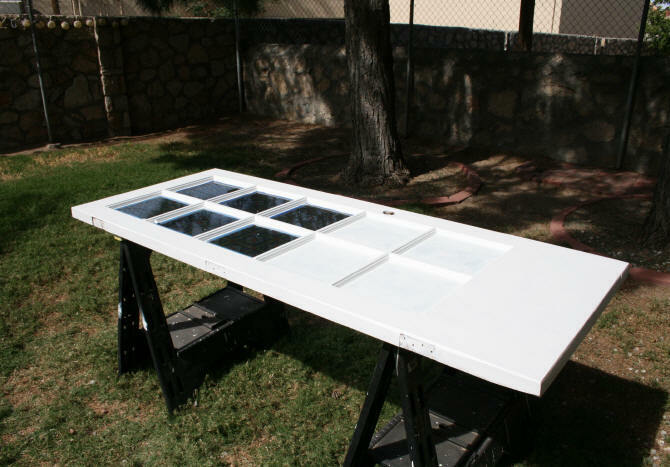 While working on the man cave I needed to paint a 6-panel door white. This door that leads to the laundry room, 4th bedroom, and closet, was a replacement for a plain brown door that had been chewed up by one of our dogs. When my husband installed it, I wondered why he had replaced the plain door with the 6-panel door. When I started looking at doors, I found it is easier to find the 6-panel doors than the flat surface doors. 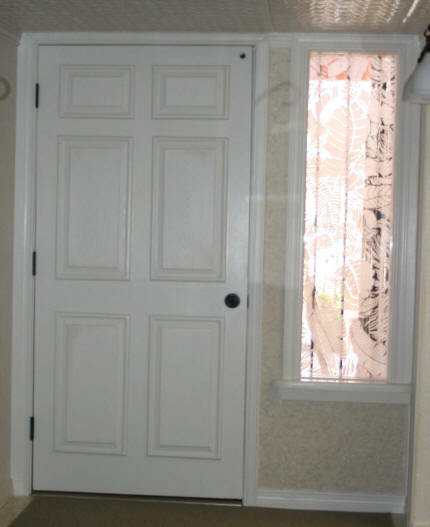 The hollow core doors are also very inexpensive. Which answered my question as to why he had bought the 6-panel. I thought about painting all of the brown doors in the house white. Many of these doors though were damaged in one way or another. So I decided to replace all of the doors with the 6-panel doors. At an average cost of around $25, I felt it would be a worthwhile investment and would brighten up the house considerably. The exterior doors (those leading to the outside) were another story. 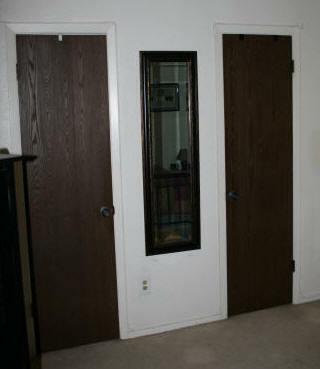 These doors are solid wood which are much more expensive to replace. There was nothing really wrong with these doors except for a little water damage on the two French doors, old paint, and dog scratches. These would be repaired and painted. The first step was to go around the house and measure the width of the doors that needed to be replaced. 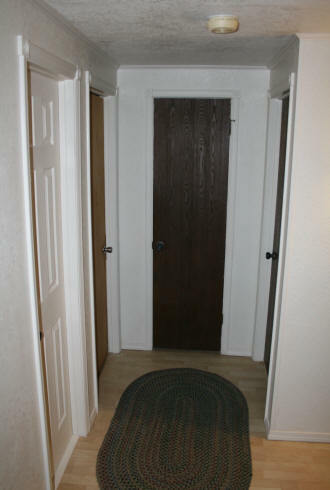 Not that any of the doors were exactly the standard width. I knew I would need to cut down the standard sizes to match the existing doors. I also planned to purchase the doors with the door knob hole already bored in the door. I also needed to buy new hinges. The old hinges were a tarnished brass finish and some were pretty nasty with paint on them. I bought what I needed, plus a few extra, from the same company I purchased my door knobs, eBuilderDirect.com. Their price was much cheaper than the big box hardware stores. 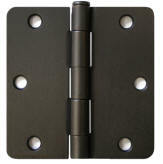 The hinges are of good quality and come with the matching screws. Since there was no way my SUV would fit all ten doors, I bought them as I needed them. The first set of doors I started on was the main hallway. The first thing I did before removing any door, was note any problems with the existing door I had. Like whether it was sticking in any areas. This way when I trimmed the new door I could cut an extra 16th of an inch off the edge to avoid the sticking the old door had. If the door had too much of a gap on the bottom. I adjusted this also. I placed the new door flat down on a set of work horses. The old door was placed on top of it. The side with the door knob hole was aligned. I then drew lines on the hinge side, top, and bottom of the doors where I needed to trim off excess so they would fit in the opening. After cutting them on my table saw, I placed the old door back on the newly cut door to make sure it was cut correctly. I then marked the location of where I would need to chisel out the hinge recesses. With one of the new hinges I had, I traced the outline of the hinges onto the side of the door. I then cut each outline of the hinge recesses with a sharp blade in my cutter. Going as deep as the thickness of the hinge. I then took my chisel and hammered a wider dent along the edge of this outline. I used a flathead screw driver instead of a chisel around the hinge corners. With the outline of the hinge clearly marked, I held my chisel at an angle and tapped the end with a hammer to remove the wood as thick as the hinge between the carved hinge markings. I used a new hinge to make sure I went deep enough. After cutting the door hinge recesses I took the door to it's new home and attached the door with the new hinges in place to check the fit. You would think, that after all the steps I made to make sure the door was exactly the same size as the previous door, it would go up easy as could be. Not! Something always had to be tweaked. Some of the problems were with the frames. Like the recess in the frame was set a little too forward or back. 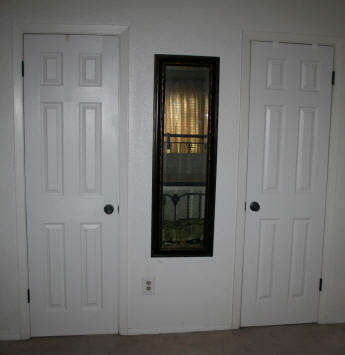 Each door and door frame presented different problems that were fixed. When the door finally fit properly, like it should, it was then painted with the same white as the walls. 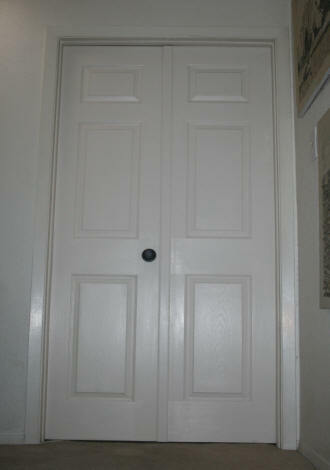 I also painted the door frame where the old hinges and door knob strike plates were. The house had been painted a few times over the years around all of this hardware. 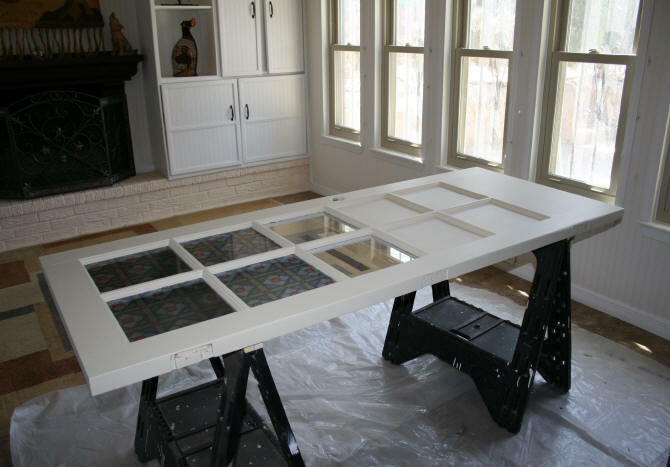 The frame just looks cleaner when you paint these areas BEFORE you place the hardware on. 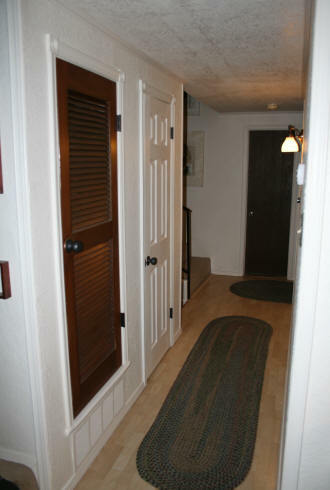 The brown louvered door is the closet for our gas furnace. It has not been painted or replaced. I am hesitant to do anything to this door. It is made of good solid hardwood and has a decent stain on it. I did replace the door knob with a matching dummy knob and the hinges. 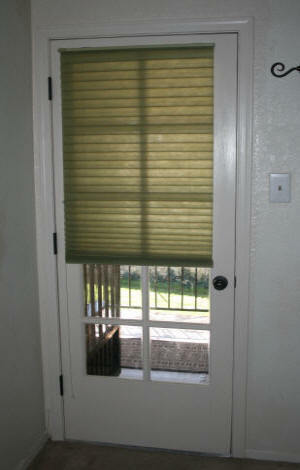 The louvered door has a spring roller touch catch which is why I only needed a dummy knob. I purchased door stops also. Many of the old doors did not have any stops. Which means, there were areas in the drywall that show where doorknobs had hit the wall in the past. I needed 2 lengths of doorstops. I purchased a 4" rustic door stopper and the 3 1/4" door stopper both from eBuilderDirect. Most of the doors that open up with a wall behind them used the 3 1/4". The 4" was used in odd areas like the closet door in the center of the photo above. When this closet door is opened all the way, it hits the door stop moulding on the right door. Gouging the moulding. The door stops were also placed at the top of the door instead of at the bottom of the door or on the wall. The dogs just love to chew on the door stops. Up high, they can't touch them. The door that provided a challenge was the master bedroom door. It is actually two doors that cover a 40" opening. They do not make the 6-panel doors in a 40" width. Nor do they make a 20" 6-panel door. Both are not standard sizes. There was the option to have a custom made door made, but that would have been too expensive. So what did I do? I did some measurements on all the doors I had already installed to see where 20" would hit on the doors. On the 36" door, it measured just 20" from the edge to where the moulding was on the second column of faux panels. So I purchased two 36" doors. I then ripped both of them with my table saw through the center at the 20" mark. I then cut of the ends of the scrap piece to get the edge which I glued with wood glue into the gaping hole on the now 20" door. I now had two 20" doors. 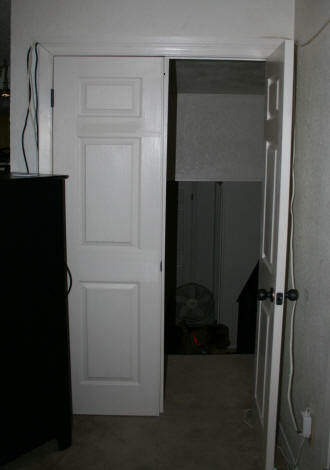 I added a piece of moulding, to the door that locks into the ceiling, on the side that faces the hallway. 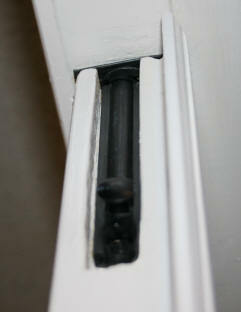 Photo on the left shows how the door slide locks into the top of the door frame. After you lock this door into place, you close the side with door knob. The photo on right shows one of the scrap door piece after I ripped off 20" and the end. I saved them for no known reason at the time. I did end up using one of the door pieces for the main entrance door. As of September 2013, there are two more doors I have yet to replace. The master bedroom closet doors. I need to work on this whole wall removing the cable lines that go up and down around the door frames. I also want to replace the moulding around the door. I have been holding off on this until I work on the master bedroom. I want to tear out the carpeting and replace it with laminate flooring. I want to place the new door moulding right on top of the new flooring for a finished look instead of trying to cut the laminate around the moulding. So this job is waiting until I have enough energy and my hands are in better shape to do all of the ripping AND I have the money to buy all of the laminate I need to replace the remaining carpet in the house. However, In November 2013 I replaced the master bedroom closet doors. I had to keep moving the doors around in the garage and I was afraid I would eventually damage them. I decided to install the doors before they were damaged. 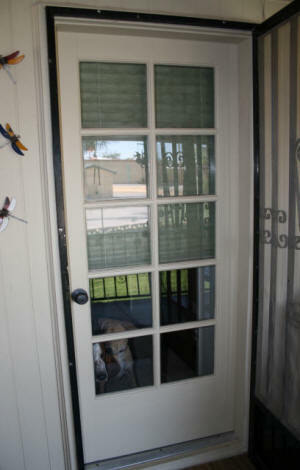 The French doors that are in the living room and master bedroom, that lead to the balcony, were removed and repaired. Each door took about two weeks to strip, repair, and paint. However, these doors took a couple of decades of punishment from the sun and rain before the balcony roof was added The paint was peeling and there was water damage. The inside paint was also discolored and needed to be painted. 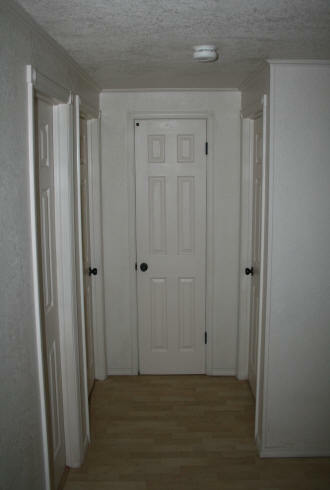 The photos below show the bedroom door after being repaired and painted. The French doors were taken off the hinges and placed flat on work horses. The stripping of the paint took a while. All of my previous strip and paint projects were done using metal scrappers and sandpaper. In this case, I was having a hard time getting the paint off around the glass. The front entry door I worked on was completed August of 2013 while I was working on the front entrance. Actually, I started working on the door and that job evolved into the main entrance remodel. I did not take a picture of the outside of this door but it was the same orange color shown in the backyard photo below. 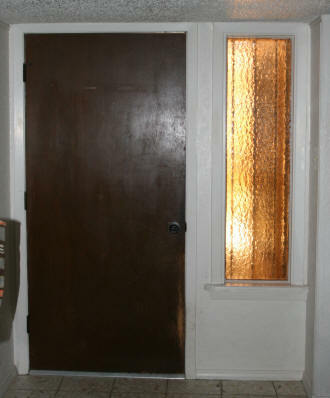 The inside of the door was the flat brown that matched the doors in the rest of the house. The entrance door also had the usual dog scratches. 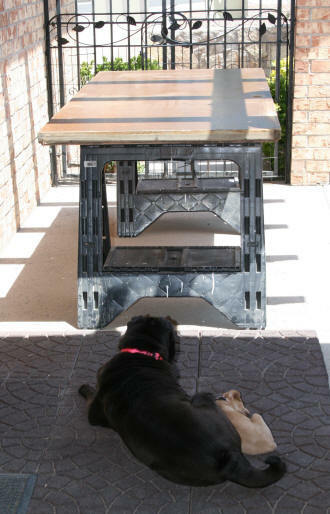 The front door was removed from the hinges and placed on a set of work horses on the front patio. I sanded off all of the paint on this side of the door down to the bare wood. The other side of the door took a lot more work. The door on the outside had some unique moulding that I wanted to keep. With all of this moulding it took a while, even when I used the stripper, to remove all of the old paint and then sand the door down. 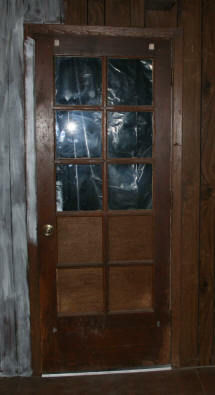 When the door was finally stripped, I used the outdoor oil based primer and then the latex top coats. White on the inside and the new outdoor color I used on the balcony on the outside of the door. Finished front door - outside The completed outside of the front door is shown on the left. The door was previously painted one color, orange. 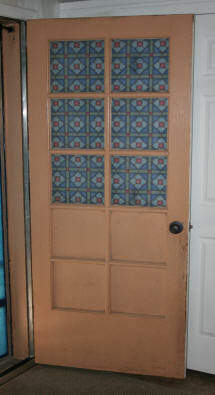 I painted the entire door, after stripping the old paint, with the new outdoor color I am painting the exterior with. For the moulding, I added a little bit of black to some of the paint to get a darker color. I used the darker color to paint the moulding and added the gecko motif. 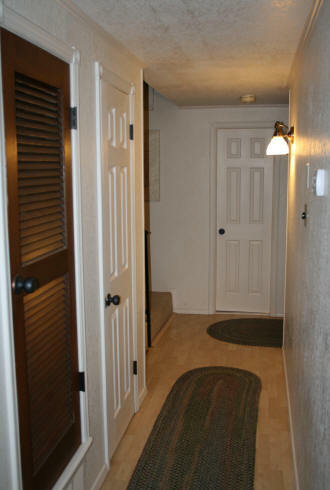 The inside of the completed door is shown below. 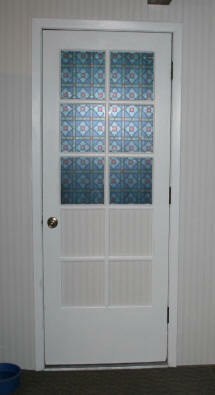 Now that I had 6-panel doors throughout the house, I wanted this door to look like it was a 6-panel door. But I was not going to buy a new door. 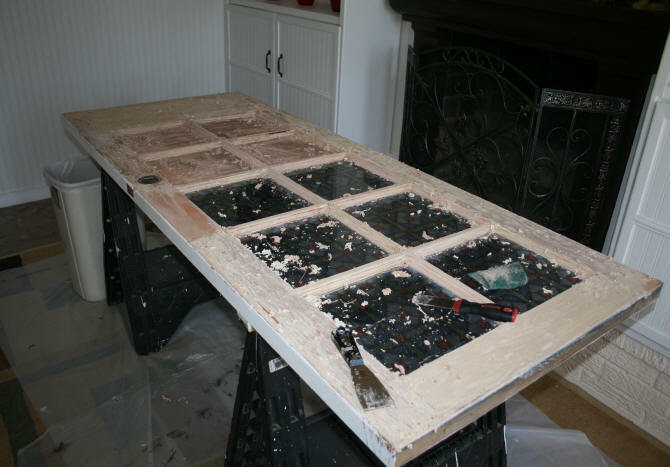 What I did have were the two scrap pieces from the two 36" doors I chopped in half to make my master bedroom doors. With one of these scrap pieces, I cut out the six panels along their edges. I then glued them with wood glue on top of the sanded door after measuring and marking where to put them. Along the edges of the faux panels I used quarter round moulding. I then used wood filler to put in the crack between the seam of the faux panels and moulding, sanded it smooth and then caulked around the outer edge of the moulding. 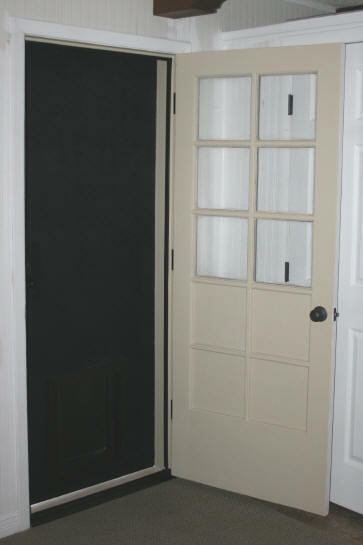 I guess I could have just used moulding to make the faux panels, but I wanted this door to match the other doors as close as possible. 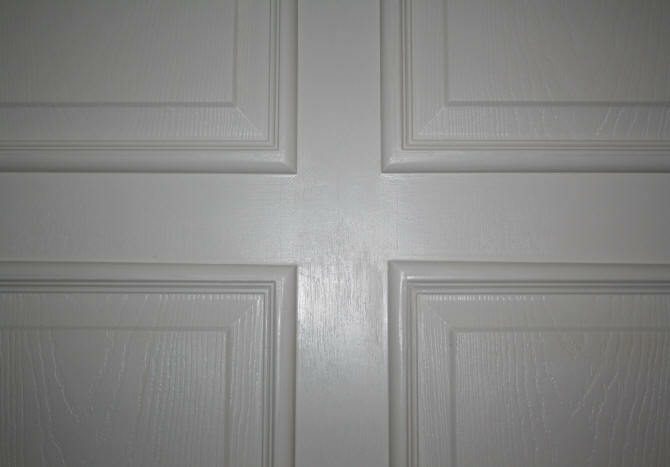 The photo below shows a close-up of the faux panel and moulding. And yes, when I renovated this entire area I got rid of the hideous gold colored plexi-glass. I will cover this topic on the house entrance page. The only doors I have left to do are the two in the master bedroom and the outside of the backyard door. One thing I have noticed this past summer (2013), was the amount of swelling the wood and doors in this house undergo when the swamp cooler (evaporative cooler) is being used. I thought I had all the doors working good, with no sticking. This summer the humidity level made many doors stick to the point where they could not even be opened. So I have had to go back and further shave down some doors. What did I work on after the front entrance door? The outside door that leads to the backyard at the lower level of the house has only been done on the inside. The inside of the door was done when I was working on the man cave. 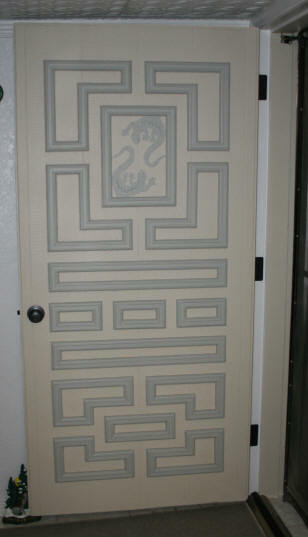 This door is pictured below. 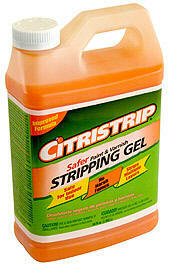 After removing the door, I applied my stripper to remove the orange paint. Fortunately, this door only had three coats of paint. The orange, then beige, and the white primer. 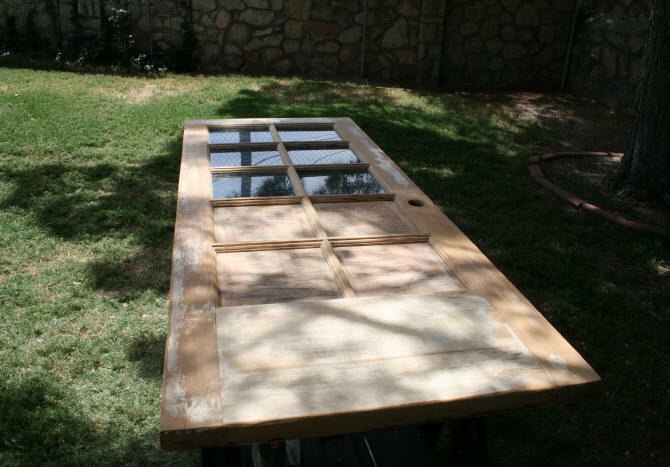 After stripping most of the paint, the door was moved outside for the sanding. After the door was sanded down smooth, I cut some of the left over ABS sheet I had used on the backyard wrought iron door to cover the four sections on the bottom. The plywood on the bottom was very thin and damaged. The ABS would also give an additional layer of insulation to the door in addition to protecting the door from dog scratches. 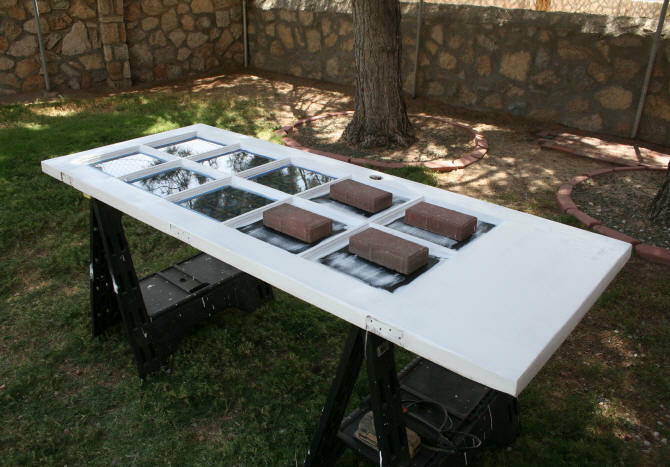 The ABS sheets were glued on with Liquid Nails and weighed down with a brick for a day. Backyard entry door now complete The entire door was then primed with oil based paint. Sanded with a 200 grit sandpaper, then primed again. I let the door sit for a couple of days. After the second coat of primer was thoroughly dried, I sanded the door again with 320 grit sandpaper. The door was then moved inside for the final coats of latex paint. New hinges were installed and the door hung. The weather stripping I had installed on the other entry doors in the house and storage shed were added to this door stop.